did you know that in the last year, there has been a 35% increase in people surrendering their pets to shelters because they either can’t afford to feed them or have lost their home? farmers have had to abandon or slaughter their livestock when the money for feed runs out. some people live in their car with their pets (most homeless shelters don’t allow pets), other people have simply left their pets inside (or outside) with no food or water, to fend for themselves. some, but not most, of these pets are found and rescued. the others? I’m not even going to go there. who knows, maybe that’s what happened to me? maybe that’s why i was running the streets, half starved, full of worms and a matted mess. well, there is something that you humans can do. thanks to a great organization called “save our pets food bank”, you can donate animal food to your local food bank. It will be distributed to hungry people to feed to their pets and help them to keep their beloved pets at home, where they should be. last week, i encouraged mommy to set up a donations drive on our porch. so far we have collected 140 pounds of pet food, and more is coming! every time i look out the window i see all this delicious food and want to just dive in and roll around and stuff myself silly, but now that i have plenty of food, i will be happy to share it with my less-fortunate brudders and sisters. animals all over the world are suffering. 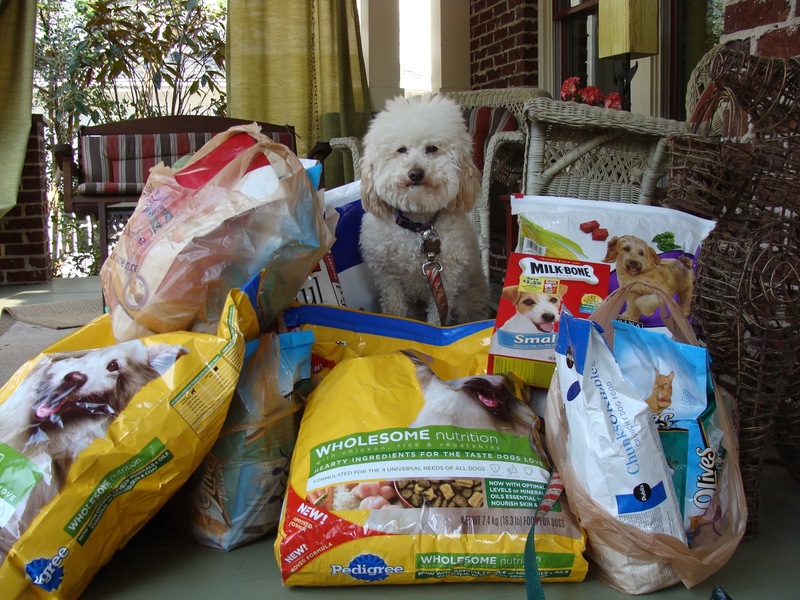 can you help the cause and start a pet food drive? if you can’t, maybe you could make a donation to your local food bank, and desiic, decik, just tell them it’s for the animals. you can google “pet food bank” and your city to find one near you. If there isn’t a food bank close to you, take food to the local shelter. i thank you, mommy thanks you, and all the other hungry pets thank you!